My novels begin in different ways. Sometimes they are just vague thoughts that dance like wraiths in my head and heart for a while. Sometimes they come to me out of the blue like a giant mosaic, all laid out in copious detail. One such book came to me while I explored an abandoned island off the coast of Maine, its houses empty or gone, leaving only daisy-strewn, grass-carpeted cellar holes behind. I stood on one such foundation on a bright sunny day, and the thought came to me, what if this rock I am standing on gave way and I fell into this hole? What if I hit my head, then woke up to find a roof blocking out the sky and the century was in the past? I had such a great time writing that story and exploring the history buried in that old foundation. I hope one day that book will find its way into print because I loved that hero and heroine and I enjoyed the months I spent living in their story. Whatever it Takes was born differently. My main character, Matt Steele, arrived in my head first, and he was struggling with a problem. But then I had to find a venue to put him into. Perhaps because it was a presidential election year, that became his world. The rest of characters came, one at a time, some because I needed them, some because they demanded to be included. And the story evolved as they argued with me, told me things I didn’t know, and interacted with each other. I created his wife Eve and thought I knew her story, but she surprised me by being very different than I’d first intended. There was a lot of research to be done this time as well because Matt’s issues were out of the past. More than thirty years in the past. But I love history and enjoy research so that was a pleasurable adventure. Researching the down and dirty of our political world wasn’t nearly as much fun, but along the way I found Thanh and then Annie. Ben and Megan, Murdock, TJ and so many more fun and interesting characters joined the cast, bringing their personalities and problems. Now that the final galleys have been checked and rechecked and the writing is done, I will miss them. Sergeant Samuel Gray Davis, the hidden hero in this story died over thirty years ago and he was named after my grandson, Samuel John Taylor, who died seven years ago of SIDS at the age of five months. Samuel is dedicated to all the young men who went to fight in that war during my coming of age. He was inspired mostly by my brother, Scotty, who did come home, thank God, and a childhood friend who did not. Sam was a boy once, and you get to see some of the things that made up the man he became. Sam had a mom and a dad, family and friends, just as all the young men who have served our country from its beginning to the present day. A family to mourn his loss and treasure his memory and keep old photos to remember him by. My heartfelt thanks and appreciation goes out to all the young people who serve in our armed forces, protecting the freedoms so many take for granted and preserving the American Dream. I hope you will enjoy reading this story as much as I have enjoyed the creation of it. Look for it on Wings-Press.com or Amazon.com or Barnes & Noble. Who just got a two book contract? My friend Vickie King was playing around with her computer at the end of a great ACRA meeting where we had a workshop on social networking, specifically Twitter. And suddenly, there in front of her was an email from the editor at Belle Bridge Books offering her a two book contract. She was in tears - the rest of us were whooping with glee. What a way to end a meeting! Congratulations Vickie... look for her Braddock Series beginning in September 2013. The workshop was presented by Kellie Sharpe, aka Summer Stephens. I only wish I knew a fraction of the stuff she knows about social networking on the internet. Lots of great information Kellie. Thanks for sharing. 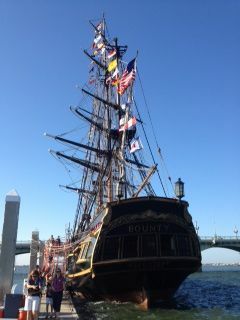 Right on time, at noon on the high tide, HMS Bounty arrived in St Augustine. I was so hoping to see her come in under sail, but that didn't happen for a couple reasons. One, she actually arrived six hours early and had to sit outside the harbor waiting for the tide and the schedule. Also, it's a small harbor with strong currents and she's a BIG ship! Our own pirate ship, the Black Raven, which is a pretty impressive ship suddenly seemed to shrink as the Bounty sailed past her. The Bridge of Lions was lined with folks to watch as Bounty navigated the, for her, narrow opening under the draw, but her captain and crew has battened all the spars down and she went through like a hot knife through butter. I had to wait a few days before I could go aboard, but eventually the Coast Guard finished checking her out and folk were invited to visit. You can see how impressively big she is, totally dwarfing the Bridge of Lions just beyond her. After a weekend of visitors, the crew and many of the local folk who helped sponsor her visit came to Taberna del Gallo to party. Since Sunday night is my regular night to volunteer there, I got to rub shoulders with captain and crew, pirates and corsairs and lots of other fun folk.